As most readers of this blog know, we teach organizations how to be more systematic and intentional about creating their cultures. The foundation of that process is articulating and practicing the behaviors (we call them Fundamentals), which you most want to see. In this post, and in some of my future ones, I’ll take one Fundamental and explore it in more depth. Beyond the business application of this Fundamental, rapid response has always felt like a deeply personal thing to me. If someone has a question or an issue, it just seems impolite or rude not to get back to them . . . and quickly. A remember when I started in business right out of college, I was so surprised to see how thankful people were when I did simple things like returning their phone calls promptly! I couldn’t imagine that something this basic would separate me from the competition. But it did! Amazingly, after more than 30 years in business, not much has changed. I still cannot understand why most people don’t return phone calls or e-mails. It literally astounds me how much time we spend following up on calls and e-mails that are ignored. And how something as simple as rapid response distinguishes us from the rest. I also want to point out two additional aspects of this Fundamental that are important. The first is the notion of acknowledging receipt of a question. When people reach out to me, they want to know I’ve got their issue and that it didn’t fall in a black hole. Something as simple as a quick e-mail saying, “I got your VM, I’m working on the issue, and I’ll get back to you by tomorrow morning” goes a long way to helping people feel important. In a similar way, keeping others updated on the status of their issues also lets them know you take their concern or question seriously. I’m so frustrated when I never hear back from someone. A quick phone call, VM, or e-mail just to let someone know where the issue stands and what to expect once again shows them that you care and that you’re on top of it. In this day of nearly 24-hour access and multiple communication modes, there simply is no good reason to have slow response time. Regardless of how busy we are, we can always send a text, or an e-mail, or leave a voicemail for someone, even late at night. 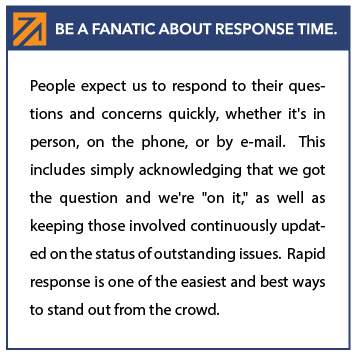 What might it look like if all your employees were fanatics about response time? How might that impact your customer relationships? More importantly, how might it impact your results? The Fundamentals Process is a proven system to help your staff more consistently practice the behaviors that lead to success. If you’d like to learn more, just give us a call 877-HPC-5050 or send us an e-mail.